This past week, I visited family in Moravia, which is a farming region in eastern Czech Republic. Fields of green border forests and sloping hills, with many a fruit tree lining roads and villages in this sleepy part of the country. However, Moravia wasn't always sleepy. It is the site of one of the greatest battles in European history, which took place during the Napoleonic Wars. Napoleon was a French Emperor who led a huge army through most of Europe, killing hundreds of thousands of people. In Moravia, his army met the forces of the Austrian and Russian Empires at the Battle of Austerlitz on December 2, 1805. Napoleon commanded an army of over 500,000 men. His soldiers fought with muskets, bayonets, pistols, and cannon. Ordering an army that big to march must have been a huge challenge. Just think about all of the food that everyone would need to eat! Still, Napoleon was a very smart commander, and his army moved over 600 miles in 8 weeks, all walking. He finally got to Moravia in November. Everyday people, many of them poor, were forced to give the army food, money, and other supplies. Finally, the army reached the place that Napoleon wanted to fight. The Battle of Austerlitz was long, one of the bloodiest in history. Napoleon's army took on the combined forces of Austria and Russia, which tried to break through and surround him. In the end, the French won a huge victory. Today, people remember the wars every year on Napoleon's birthday. Some dress as French, Austrian, or Russian soldiers and re-enact the battle, which means act it out just like it happened (but without real weapons). Many Moravians have found artifacts from the armies, like pistols or clothing, in their backyard. This past weekend, I went to a music festival in eastern Czech Republic. The festival, called Colours of Ostrava, had everything from music to theater to poetry to lectures on Russia, Europe, and freedom. It was an amazing experience, with many different opportunities to learn about and explore Czech culture. One of the most interesting things about the festival, though, was the location. Giant steel towers stood hundreds of feet above the stages, while huge buildings made of metal and brick, streaked with rust, spoke of the area's early days as a coal town. 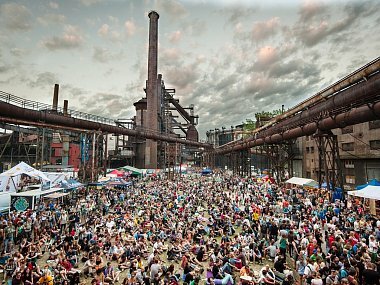 The festival took place in Dolni Vitkovice, a 200-year old coal plant where many of the city's people used to work. The factory once ran all day and all night, with giant machines turning coal into fuel, called coke. Coke was made when workers shoveled black, dirty coal into giant ovens, where temperatures usually went over 2,000 degrees Fahrenheit. Because the ovens were so hot, bad parts of the coal, like tiny bits of water, were burned off. Once the coal was burned down, or refined, into coke, the coke was then used as fuel in a blast furnace, a type of very powerful oven. Blast furnaces are used to make iron, which is then used in buildings. The plant at Dolni Vitkovice once produced 300,000 tons of foundry iron every year. Then, the plant went out of business. Luckily, though, it has been protected by local people. Some areas are now used for meetings, concerts, and other events. Today, the biggest storage tank has been turned into a concert hall that seats 1,500 people. A science academy has also been built on the property. In many places around the world, old factories are left to crumble away. It was very interesting to see how Ostrava's people transformed their old coal plant. Today, the site is a European Cultural Heritage Site, and guided tours are available throughout the year. After spending some time in Prague, I decided to head out to a castle that I remembered from my childhood: Karlstejn. This massive fortress towers over the surrounding countryside, perched high on a hill. It is named after Charles IV, Holy Roman Emperor, one of the Czech Republic's most famous historical figures. The castle is an imposing sight, with tall white walls and a blue stone roof that challenges all who see it. While parts of the castle were taken during different sieges over the years (a siege is when one army surrounds another and tries to defeat it through both fighting and starvation), the tall keep never fell to an invader. While some castles are filled with beautiful decorations, they are all built with battle in mind. Karlstejn Castle has walls that are 30 feet thick in some places to keep out invaders. Its highest tower stretches up over 175 feet into the sky. Meanwhile, the well is over 200 feet deep. A watch was kept around-the-clock to make sure that no one surprised the castle garrison with an attack. Living in a castle was not fun, but it was very safe. Walking through Karlstejn, I imagined what it might have been like to live there. The stone walls must get very cold in winter. The castle is now almost 700 years old. It was first built in 1348 in order to protect the crown jewels of the Holy Roman Empire and the Bohemian kingdom. Over the years, more and more fortifications were added to the castle. Inside, the king and his retinue lived in safety. Beautiful decorations filled a good deal of the rooms. Charles IV was a devout Catholic, and like many rulers at the time, he spent huge amounts of money on the castle's chapels. His own private chapel area is filled with gold, silver, an jewels, as well as incredible paintings of great saints. ﻿ I've been traveling in the Czech Republic for the last two weeks. This country is filled with forests, castles, cathedrals, rivers, and a very interesting culture. Prague, the capital, sits along the Rive Vltava. There are many legends about this place, some old, and some new. Next time I might write about some of the legends surrounding Prague. This time, I want to tell you about a real-life hero that walked the streets of Prague more than 70 years ago. His name was Sir Nicholas Winston. Sir Nicholas Winston was a British clerk who came to Prague in 1938 to help his friend, who worked with Jewish refugees. Refugees are people running away from a disaster. The disaster that thousands of Czech and German Jews were running from was Nazi Germany. Nazis believed that they were better than all other people, and that some people, like Jews, should be killed. They did many terrible things, and started the Second World War. Sir Nicholas Winston knew that the Nazis would come to Prague soon, and he started trying to help save Jewish children in the city. He set up an office where parents could come in with their stories. Then, he organized families in Britain, making sure that the children he saved would have a home. Raising money for hundreds of children, getting planes and trains figured out, and working with slow government offices was hard work, but Sir Winston knew that he had to do it. By the end of a year, Sir Winston had saved 669 children. Many children and families who stayed behind died during the war. Sir Nicholas was a humble man, and he never spoke about what he did. It was only when his wife discovered lists of children and their families that people found out. Today, many of' Winston's children' are grandparents. They owe their lives to him.